Pedestal mount 6", small teeth. Total length: 164 mm. Round base and top plate, diameter 64 mm. Multiple holes for radial adjustment. Black. Combine complete sets with loose parts and create your own unique design as needed. The angle between the Pedestal Mount parts can be changed as required. Can be angled sideways in steps of 11,25°, up to a maximum of 180° (16 different positions). The round mounting plate has a diameter of 64 mm and has multiple holes for radial adjustment. 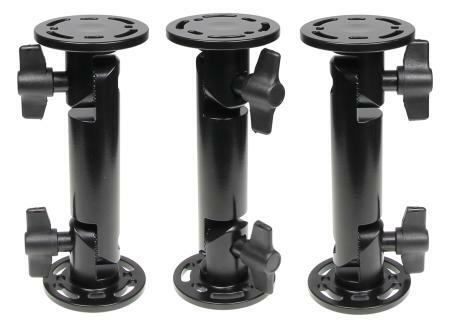 This Pedestal Mount also comes with a wingnut in each interlocking joint in order to allow for easy and quick adjustment of the angle setting.